The historical Kanō Motonobu lived from 1477-1559, according to the Metropolitan Museum of Art. Other sources give different dates. Also called Ko-Hōgen, Eisen, Gyokusen, attended the lessons of his father Masanobu and those of Oguri Sōtan. He adopted a special style, borrowing from the Chinese and the Tosa school. He was in great favor with the Shōgun Yoshihisa, Yoshizumi, Yoshitane and Yoshiharu. He received the title of Echigo no kami and that of Hōgen after having his head shaved. He was a friend of the sculptor Gotō Yujō whom he supplied with most of his subjects. 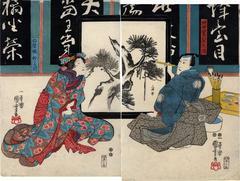 Motonobu is the most celebrated painter of the Kanō school. Quoted from: Historical and Geographical Dictionary of Japan by E. Papinot, who gives Motonobu's dates as 1476-1554. "Like his father, Masanobu, the first of the Kanō painters, Motonobu served the Ashikaga shoguns (a family of military rulers who governed Japan from 1338 to 1573) and inherited the Chinese-inspired monochromatic ink-painting style (suiboku-ga, “water-ink painting”) favoured by the Ashikagas. Motonobu, however, was also the son-in-law of Tosa Mitsunobu, founder of the Tosa school of painting specializing in the native Yamato-e (Japanese Painting) style, and he effected a compromise by combining the strong brushwork of the Chinese suiboku-ga with the decorative appeal of the Yamato-e. The resulting style was especially suitable for large-scale compositions and practically dominated Japanese painting for the next 300 years. A gifted and versatile artist, Motonobu excelled in landscapes (both in monochrome and in light colour), figures, and flower-and-bird pictures. He executed many paintings on the sliding panels of the Reiun-in monastery in Kyōto, where he decorated three rooms with landscapes painted in the styles of three different Chinese masters: the soft ink-wash style of Mu-ch’i Fa-ch’ang (late 12th–early 13th century); the hard, stiff style of Hsia Kuei (1195–1224); and the broken ink style of Yü Chien (c. 1230). Some of Motonobu’s paintings, originally done on sliding panels, were subsequently mounted on hanging scrolls; these include the important “49 Landscapes with Flowers and Birds” (also in the Reiun-in monastery), which prefigure the monumental decorative compositions of the later Kanō artists, Eitoku (1543–1590) and Sanraku (1559–1635)." Ex B. W. Robinson collection. 1848/3 An artist taking inspiration from a bijin in his screen painting of a pine tree. This scene commemorates a performance of Mukashi gatari inazuma hyoshi (昔語稲妻帖).